Oh, Kale. A vegetable I couldn’t pick out of a line up just a few years ago – now I can’t seem to get enough of it. Heidi Swanson’s Harrissa Spaghettini was one of the first recipes I attempted when I joined my CSA. I had never eaten kale, never heard of harissa, but the combination of spicy chili mixed with garlic, fresh kale, lemon zest, pine nuts and salty oil-cured olives (my favorite kind) on top of a bed of whole wheat pasta sounded so incredible to me. I thought it would be impossible to track down harissa, but as it turned out, a Middle Eastern market just a few blocks from my apartment carries several canned varieties. I’ve made this numerous times with whole wheat pasta, but when my most recent head of kale came in, I decided to try it with a pound of quinoa pasta I had on hand. The results were outstanding and this remains one of my favorite dishes. If it looks a little kale-heavy, trust me, it is. I love the stuff but you can add as little or as much as you like. Follow Heidi’s recipe and enjoy. This tastes just a good cold as it does fresh out of the pot so make some extra for lunch tomorrow! 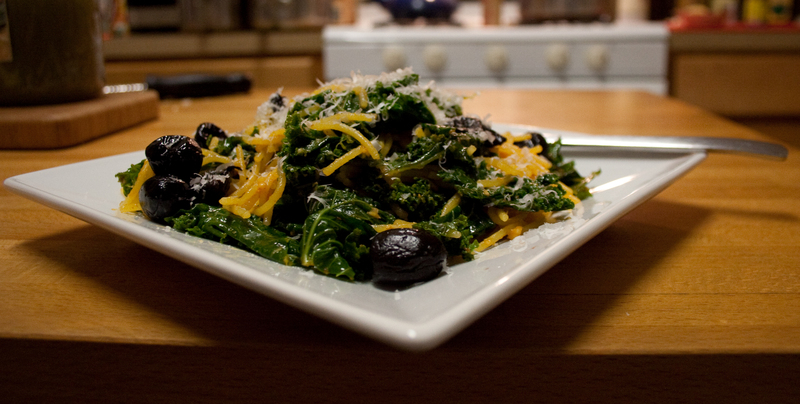 This entry was posted in recipes and tagged dinner, harissa, kale, Lemon Zest, pasta. Bookmark the permalink.